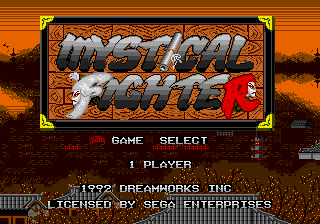 Mystical Fighter, called Maou Renjishi (魔王連獅子) in Japan, is a 1991 Sega Mega Drive beat-'em-up by KID. The game is a typical beat-'em-up — whatever story is behind the game is not in the game itself. attacks, jumps, and performs a magic ability, with several combination moves in between. You can pick up and use weapons like in Streets of Rage by pressing while near one. Main article: Mystical Fighter/Magazine articles. Main article: Mystical Fighter/Promotional material.